I have been in a FUNK lately! I have not had the time or motivation to blog lately. I have had some extra stressors in my life and the devil has been showing up here and there. I am off from work this week-YIPEE!!! I plan to get some rest and relaxation. 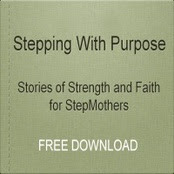 I read an article a few days ago that concerns stepfamilies and I want to share this with you. A recommendation made in this article is that when a stepfamily is formed,the marriage relationship MUST come first.The children should be prepared in advance that the pre-existing parent/child relationship be reduced to the "backseat". I feel this is very important in stepfamilies. It is in everyone's best interest that a new stepfamily succeeds. As I continue on this journey of step parenting, I struggle at times how to spread my time with all individuals involved-my husband, my 2 sons and my stepdaughter.This changes everday due to circumstances and everyone's schedules, but I firmly believe in PUTTING YOUR MARRIAGE FIRST.This will secure the child's sense of wellbeing in the long haul. Continuing The Journey!